Take a stroll through the enchanted garden full of beautiful flowers, butterflies and sundials. 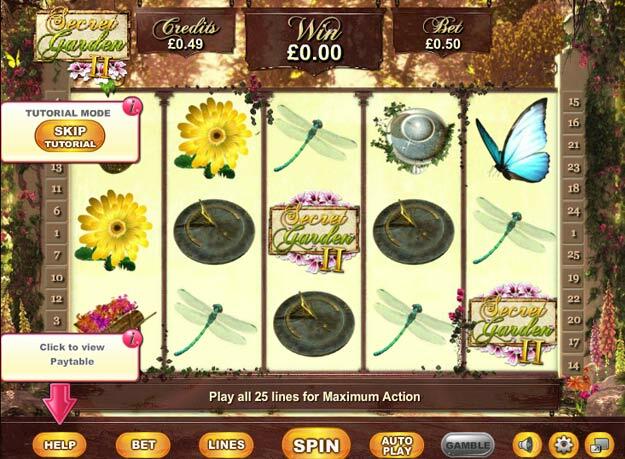 There are loads of chances to win in Secret Garden II. Take a minute to smell the roses! Secret Garden II gives you the chance to immerse yourself in fantasy fun. It has a fun fantasy theme and there are three different bonus symbols to look out for. As you spin the reels you'll see there are 25 pay lines to bet across which means there are many chances to win. The three different bonus symbols give you the chance to throw yourself into a ton of big money opportunities and there are free spins and other special bonuses to pick up. Enjoy Secret Garden II for real cash prizes.